As a result of organisations investing heavily in employee training and collaborative working programmes, there has been a steep increase in demand for large interactive touch screens in the workplace. Interactive screens are expensive pieces of kit, costing up to £20k for some models, therefore it is so important for organisations to invest in functional quality mounting solutions to support them. 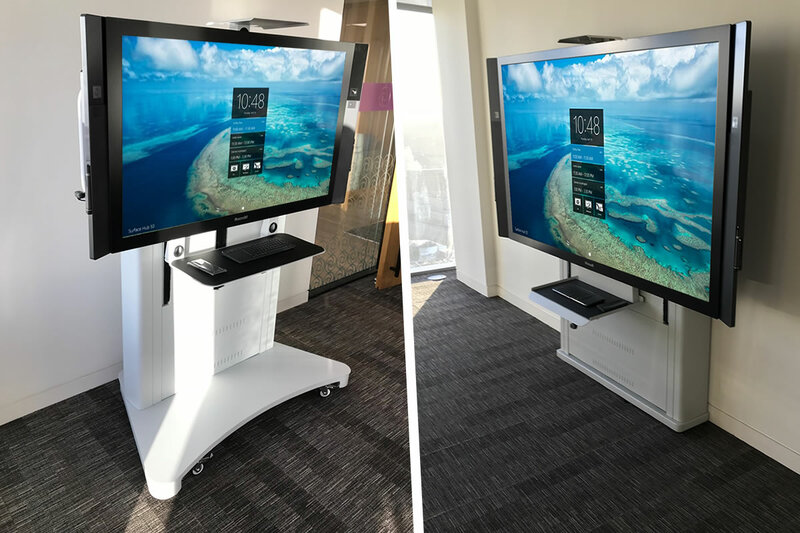 Discovery is our latest range of height adjustable Trolley and Floor-to-wall mounting solutions for all large interactive touch screens, able to secure screens up to 90” and 130kg including the Microsoft Surface Hub™. Discovery has been specifically designed to securely mount and transport large screens in the workplace. It is an ideal solution for a variety of commercial, education and retail spaces where displays and integrated AV and IT equipment can be securely stored together. The Discovery Trolley is an electrically height adjustable, mobile solution for VESA compatible large screen displays. The Trolley features robust handles either side of the screen for easy room-to-room transportation and can fit through a standard doorway, so you can easily bring it in for meetings and take out when not required. Discovery Floor-to-wall is a self-contained wall mounted digital signage solution that supports integrated AV and IT equipment. The mount is bolted to the floor eliminating the need for a solid wall bracing and combats the issue of the wall taking the entire force and weight of the screen.